6 Tomatoes cubed, or 4 cups of cherry tomatoes halfed. 3-4 Cucumbers, Chopped or Diced. 1 large Onion – whatever type you planted. 1 Tbsp of dried herbs your choose. 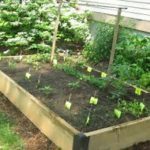 Optional Bell Peppers, Carrots, Snap peas or whatever else you may have grown in your garden. Enjoy your home and family this summer and don’t forget to Contact Jim Bigelow, Lindsey Stucky, Ally Herrmann, Scot Jobe or Kathy Zwart when it is time to learn more about how we can work to get your home SOLD! What NOT to do - Applying for a Mortgage.